One of the biggest decisions you have to make when rigging up your kayak for catfishing is choosing which rod holders to install. There are several different brands on the market and each has some advantages and disadvantages. My goal with this article is to go over some of the more popular options available and provide links that will help you determine which model will best suit your needs and style of fishing. Personally, I use Scotty Rod Holders on my kayak. I have two mounted on the front of my kayak and two on the back. The thing I like most about these rod holders are that they are adjustable. While catfishing occupies a big portion of my time, I like to do other types of fishing as well. Having the ability to adjust them to different angles and positions allows me to easily switch back and forth depending on the type of fish I am targeting. Another thing I really like about these rod holders is that I can easily remove them with one hand within a couple seconds. This is a big help when I am trying to land a monster catfish and need to get the rod holder out of the way so that I can get the fish into the kayak. You have a couple different base options for these holders. There is a base made specifically for gear tracks and then there is the 241 base which is pictured above. I prefer the 241 base because it is mounted by running four bolts through the hull of your kayak. A big catfish can create a lot of torque when it loads up your rod. Knowing my rod holders are bolted to the kayak gives me the peace of mind that they aren't going anywhere when a big fish slams my bait. Another popular option is the Stealth Quick Release Rod Holder. In addition to being fully adjustable, these rod holders have a unique locking mechanism that secures your rod to the holder. Like the Scotty rod holders, they also have different bases available. This gives you multiple options on how you can mount them to your kayak. Denny Ransom from the Tactical Kayak Angler YouTube channel uses this particular model and they have held up well with the huge flatheads he catches from his kayak. Click here to watch a review video where he goes more in-depth about them. Railblaza makes the rod holder pictured above. These are also fully adjustable to suit whatever style of fishing your are doing on a particular day. What sets these rod holders apart from others is the Starport Base which has a unique locking feature. This allows you to easily lock your holder in place while fishing but yet be able to quickly remove it if the need arises. The Starport Base is also compatible with all other Railblaza accessories including their camera mounts and lights. I personally use one of their camera mounts, the Camera Boom 600 Pro Series, in some of my videos and I couldn't be happier with it. Ram Mounts also offers a rod holder. The ram ball gives you infinite adjustability so you can set the rod holder at any position you want. Another cool feature about these rod holders is that they have a place to attach rod leashes if you choose to use them. Ram makes a variety of bases so you have the option of mounting them directly to your kayak or you can mount them on a gear track. There are also a ton of other accessories that can be mounted to the ram ball base including camera mounts, cell phones, and fish finders. Finally, there is the more traditional boat style of rod holders such as Driftmaster and Monster Rod Holders. 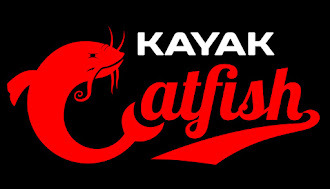 While these rod holders aren't made specifically for kayaks, many kayak catfishermen are using them with great success. Below is a picture from Korey Coates's kayak of the YouTube channel KoreCoa. He was able to make some modifications to the base so that it would fit into the gear tracks on his Jackson Big Rig. While this style of rod holder doesn't allow you adjust the angle of your rods, they do offer added strength and rigidity over the plastic models. All of the brands mentioned above have great reputations. You will just have to decide for yourself which particular brand or style will best suit your needs based on the type of fishing you do and the waters your fish.